Minnesota Public Radio News has obtained a Federal Aviation Administration inspector's memorandum detailing safety concerns about Northwest Airlines in the first few days of the strike by the airline's mechanics. The Twin Cities-based inspector has since been reassigned following the airline's complaint that he acted unprofessionally. Federal authorities are investigating the situation. St. Paul, Minn. — The inspector's memo cites numerous examples of mistakes on the part of replacement workers and Northwest managers, who have been taking care of the airline's fleet in place of union mechanics. Northwest and federal officials say the company's fleet is safe. The document dated Aug. 22, three days into the mechanics' strike, raises serious concerns about Northwest Airlines' ability to maintain its aircraft. It states that replacement workers and reassigned Northwest managers were making maintenance errors. The memo doesn't address conditions at the airline since Aug. 22. There are indications the airline has overcome some early struggles. Northwest's on-time performance, for example, has improved significantly since the early days of the strike. But on the third day of the strike the author of the memo, Twin Cities-based FAA inspector Mark Lund, wrote the situation at Northwest "jeopardizes life or property." Minnesota Public Radio News obtained the memorandum from a source close to the situation. The FAA's chief spokesman, Greg Martin, confirmed the document's authenticity. Martin called the specific allegations as yet unsubstantiated and would not comment on them. Martin says it's important to note just one inspector has come forward with criticism. Martin says the situation is complicated by Lund's own union ties. Lund is active in the union that represents FAA inspectors, even though he is not affiliated with Northwest's striking mechanics union. We want to be able to very carefully sort through those charges, and make sure that we establish the merits and substance, whether it be Northwest's charges or this inspector's charges. "This is all in the context of a very contentious labor-management situation. So an expected byproduct of that is, from time to time you will get these sorts of charges and countercharges. Certainly in this case an individual ... happens to be a union official with the FAA inspectors," says Martin. "So we want to be able to very carefully sort through those charges, and again make sure that we establish the merits and substance, whether it be Northwest's charges or this inspector's charges." Lund's memo recommends increased FAA oversight of Northwest and a reduced flight schedule. The memo cites several examples of errors in aircraft maintenance operations FAA inspectors have observed. In one instance, a line maintenance manager couldn't find the right switches to conduct an engine check on an Airbus A320. 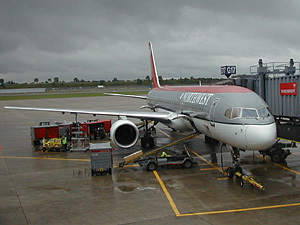 The manager, according to the inspector, acknowledged he had never performed an engine run on a live A320, and had only recently been trained on a simulator. A replacement mechanic was unsure how to close the passenger entry door on a Boeing 757. Another failed to set the brakes on a plane, as required, to assess the condition of brake wear pins. Lund also details an incident in which human waste spilled into the electrical equipment bay of a DC-10 because of a broken lavatory duct. The bay houses flight and navigational equipment. In that case, according to the inspector's memo, a Northwest manager wanted to clear the aircraft for a flight to Hawaii, but the FAA stepped in to ensure the plane was properly cleaned and checked. Lund is not speaking with reporters. Officials with his union say Lund felt sending his memo to FAA management, not going public, was the most appropriate way to raise his concerns. FAA spokesman Greg Martin says the document triggered what he's calling two extensive investigations by both the FAA and the Department of Transportation's Office of Inspector General. "The first and foremost [is] the investigation into the safe operations of Northwest," says Martin. "That's always our primary focus -- the safety of the traveling public and an airline's operating safely." Martin says the second investigation is focused on the inspector who wrote the memo. "We had received complaints that the inspector was intimidating Northwest replacement workers, was unprofessional in his conduct and exceeded his authority," says Martin, "so we are also investigating those charges." Martin says Lund has been temporarily reassigned to administrative duties. Martin says the FAA nearly doubled the number of full-time inspectors watching over Northwest when the strike began, increasing their numbers from 50 to 80. He says the FAA has made no changes to its oversight of Northwest since receiving the memo. Minnesota Public Radio News furnished Northwest Airlines with a copy of the memo. The airline declined to respond, but reissued a statement that "safety is of paramount importance to every employee at Northwest Airlines." The airline also noted that it is under increased surveillance by the FAA. Linda Goodrich, the national vice president for flight standards at the union that represents FAA inspectors, says Northwest has no basis to question Lund's professionalism. Goodrich says it's unfortunate the inspector has been removed from his normal duties where his skills are urgently needed. "He's always been a professional," says Goodrich. "He's been doing this probably close to 15 years. And I don't know of anybody that's ever seen him in anything other than the capacity of doing his job as a professional at all times." Goodrich says since the investigation became public, other FAA inspectors have raised similar concerns within their union. U.S. Sen. Mark Dayton, DFL-Minn., received the memo and wrote to the FAA and the Department of Transportation asking for an investigation of the allegations. Dayton's letter says in addition to the memo, his office has received allegations that from Aug. 20 to Aug. 31, nearly 500 FAA inspector reports filed at the Twin Cities office were not entered into an electronic database. Dayton says those reports cited defects at a dramatically higher rate than before the strike -- a rate that would normally trigger an internal FAA alert. Still, Dayton says the head of the FAA assures him Northwest's operations are safe. Dayton say he's avoiding Northwest because he does not want to cross the mechanics' picket line, not because of safety concerns. "I would not at this point advise anyone to not fly Northwest, based entirely upon the assurance that I've been given by the FAA," says Dayton. "I'm not qualified to advise anybody about safety matters other than rely on the expertise of those that have been established carrying out those responsibilities. But again, I've been given that assurance by the highest person responsible for those reviews and decisions, the FAA administrator." Minnesota Public Radio News also furnished the memo to aviation consultant Jim Hall, the former chairman of the National Transportation Safety Board. Hall called the memo well-documented. He says the concerns it raises are serious, and warrant a high level of attention from the FAA. "It raises questions about the training that these individuals received before they were put in line responsibilities," says Hall. Even though the FAA is investigating Northwest's allegations that the inspector acted unprofessionally, Hall says any time an inspector raises concerns like these, they deserve serious consideration. "When I was in government I always paid close attention to whistleblowers. While sometimes people consider them a thorn in the side, many times they're very conscientious individuals who are trying to do their job," says Hall. The FAA says it hopes to have a clearer picture of the investigation by later this week or early next week.